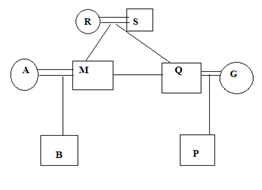 (1-5) In a family, Q is paternal uncle of B and father of P. G is sister in law of M. M is spouse of A and paternal uncle of P. S and R are paternal grandparents of B. R is the eldest lady of the family. M has only one sibling. There are totally 5 men in the family. 1. How is A related to B? 2. How is G related to R? 3. How is M related to S? Except P all three are females. 5. How is B related to Q? 6. Now he is facing which direction from his starting point? 7. Instead of turning right at the end if he took left and walked 20km, what is the shortest distance to his starting point? Some Aluminium are Steel is a possibility. 9. Which of the following combinations of mathematical signs can correctly replace ‘*’ from 7 * 36 * 9 * 2 * 3 * 5? 10. If all the alphabets at even places are left out, the then remaining alphabets are numbered from 1,2,3….. from left end then what is the position of M from left end? 1) How is A related to B? 2) How is G related to R? 3) How is M related to S? 5) How is B related to Q? 6) Now he is facing which direction from his starting point? shortest distance to his starting point? 7 * 36 * 9 * 2 * 3 * 5? 10) If all the alphabets at even places are left out, the then remaining alphabets are numbered from 1,2,3….. from left end then what is the position of M from left end?